On March 13 Marcin Gala and Phil Short cracked Sump 4 in J2. They had been underground for 15 days when the first exploration dive took place. Approximately 150 meters into the dive they had to repair a broken guide line laid by Jose Morales in 2009 but otherwise were able to use the 2009 dive line to the limit reached by Jose in the right hand tunnel at 300 meters penetration from dive base. There Phil Short led on laying a full 120 meter spool of Cortland dive line followed by 2/3 of a second spool before they were confronted with a travertine wall blocking the underwater tunnel. After some searching they discovered a small opening between a stalactite curtain that allowed them to get out of the water onto a travertine platform. 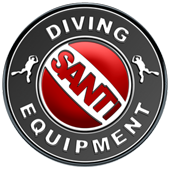 They left their dive gear there and proceeded onward for 100 meters in a large air-filled tunnel which included travertine walls and large stalactites, and one significant swim that they did in their Santi drysuits. Ultimately they reached a large borehole tunnel where the river descended into a fractured vertical fissure. Lacking vertical gear they terminated the reconn effort there. The inbound swim had been 71 minutes in a very large tunnel (12 x 6 meters with crystal clear turquoise water with white sandy floor and no silt). The return dive was 40 minute continuous swimming. Phil Short estimated the length of the sump at 600 meters. We will post a more precise number when the survey data are processed. The maximum depth was 12 meters. At the time of this report Marcin and Phil are scheduled to be transporting the Poseidon Mk6 rebreathers and carbon bailout tanks back to the downstream side of Sump 2 for a planned upstream return tomorrow mid-day. A team consisting of Nicholaus Vieira, Miko Harasimowicz, Sasha Deryuga, and Dmitry Kraev will meet them at the upstream side of Sump 2 for support back to Camp 3. We expect all parties out by this coming Sunday (March 17). Many, many others supported this dive with the hauling of equipment, food, rigging gear, and film gear over the past 5 weeks. There will be a team meeting following the arrival of Phil and Marcin in basecamp that will center on the next steps to be taken in J2. The reconn did not locate a suitable site for Camp 5 and the length of the dive puts it beyond reasonable length for running a 9 mm haul line as we currently have installed in Sump 2 (which dramatically speeds transit and increases safety). We estimate 50 to 60 minute swim time with fins only and a large equipment bag. This range distance (600m) is currently at the hard limit of our sidemount bailout tanks so considerations will need to be made, possibly by staging bailout tanks down the length of the tunnel at 200 meter intervals. Considerations for a hanging (hammock) bivouack beyond Sump 4 will also be considered. We have the equipment to do this and will reach a strategy for moving forward within the next week. Peripheral to the diving work, surface reconnaissance work up the upper Aguacate canyon by Pawel Skoworodko, Artur Novak, and David Rickel resulted in the discover of a karst capture zone approximately 1 kilometer west of the Last Bash entrance, in an area predicted to have a fault parallel to the J2 and Cheve faults. Reconn work in this area will be intensified over the next few weeks. Meanwhile, a new shaft series has been discovered in Last Bash, leading off from the base of the first pitch. 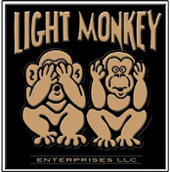 This was initially pushed by Mark Minton, Vonny Droms, Kasia Biernacka, Bill Stone, and Nico Escamilla. Today a fourth push is taking place with Matt Covington, Elliot Stahl, and David Rickel heading in with another 200 meters of rope to pick up at the -300 meter level. There is much conjecture as to where this is going. If it reconnects to the main shaft series then little is gained, but if it heads east and intersects the Jungle Series in J2 beyond the Surprise Sump, then it could result in a major fast new route to the lower levels. Currently all resupply operations are signficantly hampered due to the exceedingly tight constrictions between the -500 meter level bivouack on the Last Bash route and Camp 2A in J2. We will post further clarifications as they become available. However, as of today the expedition is on track and on schedule and a major milestone accomplished with the cracking of Sump 4. 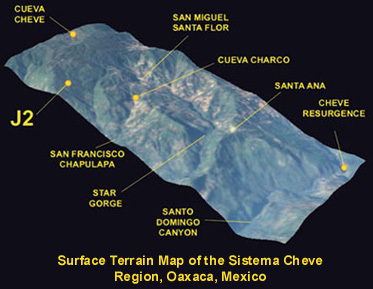 In 1987 Cueva Cheve was first discovered by modern explorers at high elevation in the Sierra Juárez of northeastern Oaxaca, México. It is presently 1,484 meters deep and is the deepest known cavern in the Western Hemisphere and the world's 11th deepest. The present limit of exploration in Cheve - at 9.3 kilometers from the nearest entrance - represents one of the most remote locations ever attained inside any cave on Earth. The logistics of reaching this point are enormous: more than two kilometers of rope need to be rigged and three underground camps established. The final depth was achieved during a 3-month U.S.-led expedition in 2003 that succeeded in placing a 4-person dive team beyond two flooded tunnels at the -1,362-meter level. The dives were highly successful and the team rapidly explored an additional 1.3 kilometers of new terrain leading deeper into the mountain. The effort was ultimately halted by an ancient tunnel collapse that blocked the route forward. No one has since returned to Cueva Cheve and the mystery of what remains to be discovered inside the Sierra Juárez endures. However, in 2004 an international reconnaissance expedition led by the U.S. Deep Caving Team discovered a new cave named J2, located high in the remote cloud forest of Ocotal, 5 kilometers northeast of Cheve. It quickly became apparent that J2 was going deep and headed in the direction of Cueva Cheve with a predicted intersection beyond the tunnel collapse that stopped the team in 2003. During the course of four major expeditions in 2004, 2005, 2006, and 2009 J2 was explored to a distance of 11.5 kilometers from the nearest entrance at a depth of -1,222 meters. To get there the team explored four underwater tunnels. Based from Camp 4, a final 19-day underground push in 2009 reached a point 300 meters into Sump 4 where the team ran out of safety guideline with the tunnel surfacing. 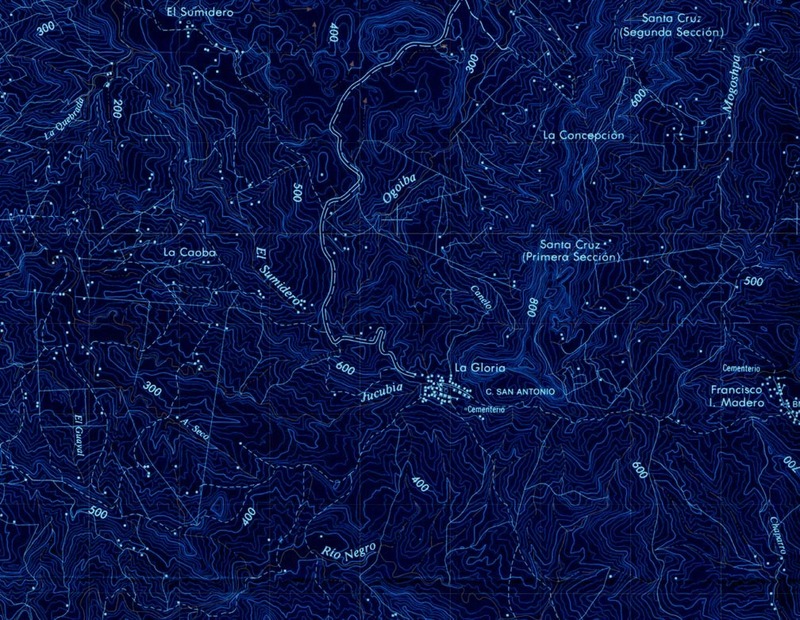 The 3D computer map of the mountain predicts that the tunnel will surface to air soon and then descend more than 800 meters vertically to cross under Star Gorge on its long way to the Mano Resurgence. Getting there will require pushing the envelope. To do this 11 members of the over-100 person international 2013 J2 team are in training to use a custom-designed, long-range variant of the Poseidon Mk6 rebreather. The briefcase-sized system is small enough to be transported to Sump 4 where the main push will begin in March of 2013. Lead divers will complete the exploration of Sump 4 and set Camp 5 beyond in air-filled passage. Teams of three persons will then commence the exploration of what lies beyond in what will surely be one of the most remote and exciting original exploration projects of this decade. The expedition will stage out of Austin, Texas the first week of February of 2013 and will be in the field for three months. The primary objective of the expedition in March 2013 will be to explore Sump 4 in J2, establish subterranean Camp 5 in the air-filled tunnels beyond, and extend exploration toward the hypothesized central trunk corridor inside the Sierra Juárez. Should this effort be successful the effort in April and May will focus on extending exploration of the trunk tunnel south towards Cheve and north to the resurgence springs. A connection with Cueva Cheve will produce a cave system more than 2 kilometers in depth. The integration of the entire system will produce a 2,597-meter-deep cave and would represent the deepest natural abyss yet discovered. The current limit of exploration in J2 represents totally unknown territory. The above map shows the surface topography (in plan view) together with the known major cave systems of the Sierra Juárez. The dashed blue lines represent a very simplified hypothesis for what might be discovered beyond these known limits. What is known was obtained through difficult exploration and mapping during 16 expeditions over 25 years' time. The distance actually traveled underground can be two to three times the straight-line surface distance. It is approximately 11 kilometers of underground travel from the entrance of J2 to the beginning of Sump 4. This is well beyond the limits of human endurance. To deal with this we break the journey into segments that represent 8 to 12 hours one-way travel time with a heavy backpack and establish underground camps at those locations. There are currently four such camps in J2, with the most remote (Camp 4, first set in 2009) being at the -1,200-meter level and beyond 220 meters of underwater tunnels. In 2013 we plan to stockpile materiel (diving equipment, food, vertical rigging equipment) at Camp 4 during the first 6 weeks of the project. From Camp 4 the lead diving team will complete the exploration of Sump 4 and locate a site for Camp 5, beyond the underwater tunnels. Studies of the local geology predict a precipitous 800 m descent following Sump 4 to a point where J2 should intersect the main Cheve river. The map above is illustrated with red and amber circles that mark the known and projected camps that will be required to explore all of Sistema Cheve from the J2 entrance. Since each camp represents a day of underground travel, a fully successful exploration of the heart of the Sierra Juárez will involve underground stays approaching one month or more. Simultaneous with the above effort, and given the large team contingent that will be on the mountain, a search will begin on the surface for a parallel, hitherto undiscovered cave system that should exist between J2 and Cueva Cheve. If discovered, it may provide an alternate, air filled bypass to the underwater tunnels in both Cheve and J2. 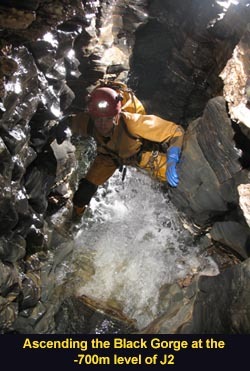 A close collaboration with expedition sponsors Poseidon Diving Systems (Sweden), SANTI drysuits, and Cupron Fabric Systems has equipped the expedition with truly state-of-the-art life support technology and environmental suits to allow underground pushes of up to 30 days and through completely water-filled tunnels. Caves are dark. You cannot see them from the surface. Their entrance often bears no portent of what is below. There is no sense of scale that can be grasped from the surface. Conversely, high altitude mountains carry the opposite visual effect: the closer you get the more powerful the sense of scale and awe becomes. No place conveys this sense of humility better than Mount Everest. From Rongbuk Monastery (far left in the upper profile; and the point of view of the photo at left) Everest is still iconic at 20 kilometers range. As you approach on the original Mallory route (the left ridge line in the photo) it finally becomes clear how staggeringly big this mountain is to anyone attempting to climb it. The above map shows the known extents of the Cheve cave system compared with a vertical cross section of Everest. The vast cave system dwarfs Everest in horizontal extent, extending from Lhotse to Rongbuk. 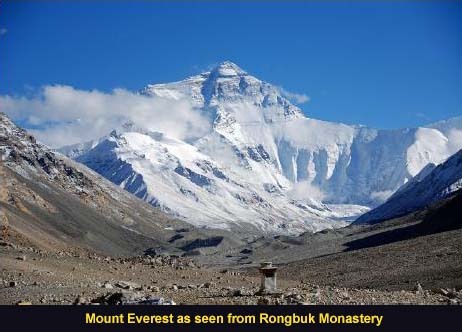 The 2013 team, if successful, will travel significantly farther underground than the distance from Rongbuk Monastery to the summit of Everest with a vertical descent below the surface rivaling the elevation gain to the summit from Rongbuk glacier. Unlike mountaineers, however, the hard part begins when you have to leave - the only way out is up.